Fantasy 5: How does weekend weather affect fantasy prep? We’re back at it again for this week’s Fantasy 5, focusing on the key things you need to know entering Week 8. Whether you’re researching information for your season-long leagues or trying to narrow down your DFS player pool, there’s generally something for everyone featured here. Here’s a look at the some of the more interesting pieces of fantasy news to know heading into the weekend games. 1. How will weather impact Week 8? People in the DFS community tend to overreact to weather, in my opinion. Our real concern is when wind exceeds 15-20 mph and rain is a torrential downpour. Anything less is mostly noise. I’ll approach freezing temperatures later in the year when they become relevant. We have several games on this week’s slate that meet these rain/wind criteria. It’s going to be important to pay attention Sunday morning for updates. Panthers @ Buccaneers: Rain-free, but winds at 17 mph consistent throughout the game. I’m not letting this impact any of my decisions and am praying some people overreact and get off this game for ownership reasons. Falcons @ Jets: Consistent rain throughout game time. Winds at 17-19 mph. Should give both defenses a boost. Like the short-area targets a bit more (Mohamed Sanu, Austin Seferian-Jenkins, and Jeremy Kerley). Chargers @ Patriots: Winds 16-17 mph. Right on that cusp of being noise. I’m not letting it impact any decision making given how well these two quarterbacks can sling it. 49ers @ Eagles: Consistent rain throughout game time. Winds at 11-13 mph. Not changing much here. Minor exposure bump to PHI DST against a rookie QB in the rain and adding a bit more LeGarrette Blount on FanDuel. Cowboys @ Redskins: Rain 65 percent at kickoff, 90 percent at end. Winds at 12-16 mph. This game opened as one of the highest-scoring game totals by Vegas and has since dropped three (3!!) points. That’s my reason to fade. In a rare mid-season trade, the Buffalo Bills traded Dareus to the Jacksonville Jaguars Friday night. 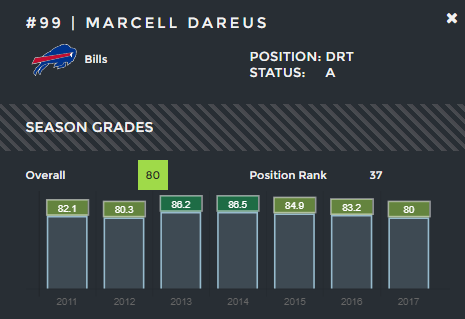 Dareus was thought to be a burgeoning star in the league after his first four seasons with Buffalo. Entering the 2015 season, Dareus signed a massive six-year, $108 million extension with Buffalo. He’s held consistently strong grades by our metrics, however, his play in 2017 has dropped off considerably. He’s played on just 40.6 percent of the team’s defensive snaps, with just three stops against the run in 54 snaps. Dareus has historically been a dominant against the run, ranking top-16 in run stops among all DTs every year except for one (22nd). Moving to Jacksonville will reunite him with former coach Doug Marrone. The Bills will receive a 2018 sixth-rounder in exchange for Dareus, that could escalate to a fifth-rounder based on performance. There are six teams on bye this week, leaving 13 total games on the slate. We’ve already witnessed a 40-0 blowout with the Ravens running away with a home game against the Dolphins, but it wouldn’t shock me at all for that to be the main theme of Week 8. Seven of the remaining 12 games have teams favored by seven or more points. The Falcons almost made it eight given their six-point spread, but we could still see that move before kickoff tomorrow. As such, it wouldn’t be surprising to see a lot of DFS lineups correlating running back and defense tomorrow. Given the massive spreads here, it’s often an optimal move to pair the two positions. Adjust your DFS lineups accordingly. 4. Mitch Trubisky breakout day? It’s no secret by now that the Bears have been hiding this year’s No. 2 overall pick, Trubisky, with a run-heavy gameplan to mitigate any potential mistakes. However, they may not have that luxury in Week 8 with the Bears traveling to New Orleans. Trubisky has attempted just 50 total attempts over the last three games — essentially Carson Palmer’s per-game average. The Saints are favored by 10 points and implied for a 28.75-point total — highest of the week. While 36-attempt games by Jordan Howard are nice for easing your rookie quarterback in, the training wheels will need to come off if the Bears hope to keep pace here. Expect a lot of passes over the middle to Zach Miller and Tarik Cohen to keep the chains moving. This week’s feature spotlight is on one of the league’s best pass-rushers that isn’t getting enough love on a national level — Melvin Ingram. Ingram is currently our No. 1 graded pass-rushing edge player. Edge includes both 4-3 ends and 3-4 outside linebackers. Among all edge players, Ingram ranks third in sacks, third in hurries, and second in total pressures. He’s finished with a PFF grade of at least 80 in 6-of-7 games to start the year. He’s rushed the passer on 94.8 percent of his snaps, producing a 14.3 pass-rushing productivity grade — third-highest among all 4-3 ends. While teammate Joey Bosa gets most of the media’s attention, it won’t be long the two of them are both under the spotlight fielding reporters’ questions.